TORONTO, ONT. – The fast-growing Nissan Micra Cup road racing series will make its Ontario motorsports show debut with an appearance at the Motorama Custom Car & Motorsports Expo presented by Mothers. The show takes place March 11, 12 & 13 at The International Centre, across from Toronto's Pearson International Airport. The 'spec' series took to the track for the first time in 2015. The inaugural schedule featured several events in Quebec, but the new tour made a big impression on the Canadian motorsports scene and demand quickly developed outside of the province. In response, the Nissan Micra Cup will add races at Calabogie and Canadian Tire Motorsport Park in 2016. Series founder Jacques Deshaies and his associates set out to create an affordable, entry-level series that put the focus of driver skill and competition, rather than budgets and horsepower. The Micra Cup cars are virtually 'stock' in nature. Updated suspensions and brake pads are the only notable performance improvements. Otherwise, the engine, gear box, transmission, etc., are all exactly as they come on a base model Nissan Micra. The result was full grids of identically-prepared Nissan Micra Cup cars, piloted by a wide variety of eager racers, including some of the country's most talented youngsters and experienced veterans. Some of the familiar competitors who took part in series races last season were: Kevin Lacroix, Stefan Rzadzinski, Marc-André Bergeron and Richard Spénard. Former World Figure Skating Champion Elvis Stojko and journalist Jim Kenzie also took part. In the end, Olivier Bédard emerged as the first-ever Nissan Micra Cup champion. "The idea behind this series was to provide a car that could explore and display the talents of the drivers, rather than having them succeed based on the performance of their cars," explained Deshaies. "These cars are all the same; it's how they're driven that leads to success. I especially believe that this series is the best way for drivers coming out of go karts to learn to properly drive a race car." With the series' expansion into Ontario in 2016, Deshaies hopes that the Motorama appearance of two Micra Cup entries – provided by Toronto's ALTA Nissan – will attract the attention of potential new drivers and teams looking to get involved in this affordable, ultra-competitive series. "Last year we built 28 cars. For this year, we should have 35 cars ready to race," continued Deshaies. "Everybody – including our first champion Olivier Bédard – has told me that they're coming back, and the enthusiasm that we saw last year, is growing. Everyone we speak with views the Micra Cup series as a good alternative to open-wheel racing and a good stepping stone into other professional sports car divisions." Visitors to the Nissan Micra Cup display at Motorama will have the opportunity to get an up-close look at a typical, race-ready Micra Cup car. The booth will also feature a video detailing the series' inaugural year. Jacques Deshaies, former ASQ President and technical advisor Gilles Villeneuve, and several Nissan corporate representatives will also be on hand to answer questions. Deshaies and Villeneuve will also take part in the Road Racing Discussion Panel. That is scheduled for 10:30 a.m. on Saturday, March 12 on the Johnsonville Stage. Discussing the participation of the Nissan Micra Cup series at Motorama, the show's Greg MacPherson said, "We are very pleased that our guests will have an opportunity to speak with representatives of the series and see actual Nissan Micra Cup cars at Motorama. In just one season, the series made a huge impression with racers across Canada and I know that a lot of Ontario road racers will be interested in learning more about the Nissan Micra Cup." 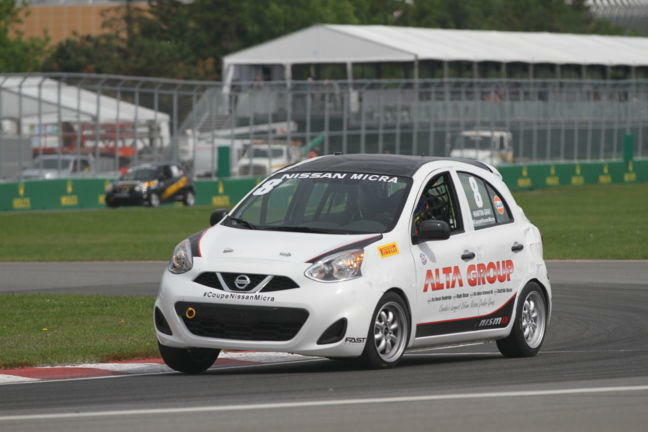 Created in 2015 as an affordable, entry-level racing division, the Nissan Micra Cup found immediate success in Quebec and will expand into Ontario this year. Races are a half-hour in duration with the season consisting of eight doubleheader race weekends. For its sophomore year, the Nissan Micra Cup will appear on the schedules of several of the country's premiere racing events, including the Grand Prix de Trois-Rivières, and the Mobil 1 SportsCar Grand Prix and the NASCAR Chevrolet Silverado 250 weekends at Canadian Tire Motorsports Park. For further details regarding the series, the website is located atwww.nissan.ca/micra-cup/en. The second annual Motorama Custom Car & Motorsports Expo Presented by Mothers takes place March 11, 12 & 13, 2016 at The International Centre, adjacent to Toronto's Pearson International Airport. With a footprint of almost 300,000 square feet, the show will be Canada's biggest late-winter celebration of automobiles and motorsports. Announced celebrity guests, so far, include Steve Darnell (Vegas Rat Rods / Welderup), Billy Gibbons (ZZ Top), Jimmy Shine (So-Cal Speed Shop / Jimmy Shine Work Shop), Jeff Lutz (Street Outlaws / Lutz Race Cars) and Gene Winfield. For information about the show, including tickets, sponsorship and exhibitor opportunities, and more, call (416) 962-7223, emailinfo@MotoramaShow.com or visit www.MotoramaShow.com.